Numerous verses describing the origins of life have been assembled in this chapter, along with certain aspects of the vegetable kingdom and general or specific topics relating to the animal kingdom. The grouping of verses scattered throughout the Book affords a general view of the data the Qur'an contains on these subjects. In the case of the subject of this and the following chapter, the examination of the Qur'anic text has sometimes been particularly delicate on account of certain difficulties inherent in the vocabulary. These have only been overcome through the fact that scientific data which have a bearing on the subject have been taken into consideration. It is particularly so in the case of living beings, i.e. animal, vegetable and human, where a confrontation with the teachings of science is shown to be indispensable in the search for the meaning of certain statements on these topics contained in the Qur'an. It will become clear that numerous translations of these passages in the Qur'an, made by men of letters, must be deemed inaccurate by the scientist. The same holds true for commentaries made by those who do not possess the scientific knowledge necessary for an understanding of the text. This question has always preoccupied man, both for himself and for the living things around him. It will be examined here from a general point of view. The case of man, whose appearance on Earth and reproduction processes are the subject of lengthy exposés, will be dealt with in the next chapter. The notion of 'getting something out of something' does not give rise to any doubts. The phrase can equally mean that every living thing was made of water (as its essential component) or that every living thing originated in water. The two possible meanings are strictly in accordance with scientific data. Life is in fact of aquatic origin and water is the major component of all living cells. Without water, life is not possible. When the possibility of life on another planet is discussed, the first question is always: does it contain a sufficient quantity of water to support life? Modern data lead us to think that the oldest living being must have belonged to the vegetable kingdom: algae have been found that date from the pre-Cambrian period, i.e. the time of the oldest known lands. Organisms belonging to the animal kingdom probably appeared slightly later. they too came from the sea. "(God is the One Who) sent water down from the sky and thereby We brought forth pairs of plants each separate from the other." This is the first reference to the notion of a pair in the vegetable kingdom. We shall return to this later. "God created every animal from water." We shall see further on how this word may also be applied to seminal fluid [ It is secreted by the reproductive glands and contains spermatozoons.]. Whether it deals therefore with the origins of life in general, or the element that gives birth to plants in the soil, or the seed of animals, all the statements contained in the Qur'an on the origin of life are strictly in accordance with modern scientific data. None of the myths on the origins of life that abounded at the time the Qur'an appeared are mentioned in the text. "(God) is the One Who sends water down from the sky. For you this is a drink and out of it (grow) shrubs in which you let (cattle) graze freely. Therewith for you He makes sown fields, olives, palm-trees, vineyards and all kinds of fruit grow." "(God) is the One Who sent water down from the sky. Therewith We brought forth plants of all kinds and from them the verdure and We brought forth from it the clustered grains, and from the palm-tree its spathes with bunches of dates (hanging) low, the gardens of grapes, olives and pomegranates similar and different. Look at their fruit, when they bear it, and their ripening. Verily, in that there are signs for people who believe." "We sent down from the sky blessed water whereby We caused to grow gardens, grains for harvest, tall palm-trees with their spathes, piled one above the other-sustenance for (Our) servants. Therewith We give (new) life to a dead land. So will be the emergence (from the tombs)." "The earth . . . We caused all kinds of things to grow therein in due balance." "On the earth are adjacent parts; vineyards, sown fields, palm-trees, similar and not similar, watered with the same water. We make some of them more excellent than others to eat and verily in this are signs for wise people." It is interesting to note the existence of these verses because they show the sober quality of the terms used, and the absence of any description that might highlight the beliefs of the times, rather than fundamental truths. What particularly attracts our attention however, are the statements in the Qur'an concerning reproduction in the vegetable kingdom. One must bear in mind that there are two methods of reproduction in the vegetable kingdom: one sexual, the other asexual. It is only the first which in fact deserves the term 'reproduction', because this defines a biological process whose purpose is the appearance of a new individual identical to the one that gave it birth. Asexual reproduction is quite simply multiplication. It is the result of the fragmentation of an organism which has separated from the main plant and developed in such a way as to resemble the plant from which it came. It is considered by Guilliermond and Mangenot to be a 'special case of growth'. A very simple example of this is the cutting. a cutting taken from a plant is placed in suitably watered soil and regenerated by the growth of new roots. Some plants have organs specially designed for this, while others give off spores that behave like seeds, as it were, (it should be remembered that seeds are the results of a process of sexual reproduction). This is the only form that is mentioned in the Qur'an. 'One of a pair' is the translation of zauj (plural azwaj) whose original meaning is: 'that which, in the company of another, forms a pair'; the word is used just as readily for a married couple as for a pair of shoes. "Thou seest the grounds lifeless. When We send down water thereon it shakes and grows and puts forth every magnificent pair (of plants)." "We caused to grow (on the earth) every noble pair (of plants)." "Of all fruits (God) placed (on the earth) two of a pair." We know that fruit is the end-product of the reproduction process of superior plants which have the most highly developed and complex organization. The stage preceding fruit is the flower, which has male and female organs (stamens and ovules). The latter, once pollen has been carried to them, bear fruit which in turn matures and frees it seeds. All fruit therefore implies the existence of male and female organs. This is the meaning of the verse in the Qur'an. The culmination of the reproductive process comes with the germination of the seed once its outside casing is opened (sometimes it is compacted into a fruit-stone). This opening allows roots to emerge which draw from the soil all that is necessary for the plant's slowed-down life as a seed while it grows and produces a new plant. "Verily, God splits the grain and the fruit-stone." "Glory be to Him Who created the components of couples of every kind: of what the ground caused to grow, of themselves (human beings) and of what you do not know." One could form many hypotheses concerning the meaning of the 'things men did not know' in Muhammad's day. Today we can distinguish structures or coupled functions for them, going from the infinitesimally small to the infinitely large, in the living as well as the non-living world. The point is to remember these clearly expressed ideas and note, once again, that they are in perfect agreement with modern science. There are several questions in the Qur'an concerning the animal kingdom which are the subject of comments that call for a confrontation with modern scientific knowledge. Here again, however, one would gain an incomplete view of all that the Qur'an contains on this subject if one were to leave out a passage such as the extract which follows. In this passage, the creation of certain elements in the animal kingdom is described with the purpose of making man reflect upon the divine Beneficence extended to him. It is quoted basically to provide an example of the way in which the Qur'an describes the harmonious adaptation of Creation to man's needs; it relates in particular the case of those people who live in a rural setting, since there is nothing that could be examined from a different point of view. "(God) created cattle for you and (you find) in them warmth, useful services and food, sense of beauty when you bring them home and when you take them to pasture. They bear your heavy loads to lands you could not reach except with great personal effort. Verily, your Lord is Compassionate and Merciful; (He created) horses, mules and donkeys for you to ride and for ornament. And He created what you do not know." --reproduction in the animal kingdom. --references to the existence of animal communities. --statements concerning bees, spiders and birds. --remarks on the source of constituents of animal milk. "(God) fashioned the two of a pair, the male and the female, from a small quantity of liquid when it is poured out." The 'pair' is the same expression that we have already encountered in the verses which deal with reproduction in the vegetable kingdom. Here, the sexes are given. The detail which is absolutely remarkable is the precision with which it is stated that a small quantity of liquid is required for reproduction. The word itself signifying 'sperm' is used. The relevance of this remark will be commented upon in the next chapter. "There is no animal on earth, no bird which flies on wings, that (does not belong to) communities like you. We have not neglected anything in the Book (of Decrees). Then to their Lord they will be gathered." There are several points in this verse which require comment. Firstly, it would seem that there is a description of what happens to animals after their death: Islam does not apparently, have any doctrine on this point. Then there is predestination in general [ We saw in the Introduction to the third part of this book what one was expected to believe about predestination in its application to man himself.] which would seem to be mentioned here. It could be conceived as absolute predestination or relative, i.e. limited to structures and a functional organization that condition modes of behaviour: the animal acts upon various exterior impulses in terms of a particular conditioning. Blachère states that an older commentator, such as Razi, thought that this verse only referred to instinctive actions whereby animals worship God. Sheik Si Boubakeur Hamza, in the commentary to his translation of the Koran, speaks of "the instinct which, according to Divine Wisdom, pushes all beings to group together, so that they demand that the work of each member serve the whole group." Animal behaviour has been closely investigated in recent decades, with the result that genuine animal communities have been shown to exist. Of course, for a long time now the results of a group or community's work have been examined and this has led to the acceptance of a community organization. It has only been recently however, that the mechanisms which preside over this kind of organization have been discovered for certain species. The most studied and best known case is undoubtedly that of bees, to whose behaviour the name von Frisch is linked. Von Frisch, Lorenz and Tinbergen received the 1973 Nobel Prize for their work in this field. When specialists on the nervous system wish to provide striking examples of the prodigious organization directing animal behaviour, possibly the animals referred to most frequently are bees, spiders and birds (especially migratory birds). Whatever the case, there is no doubt that these three groups constitute a model of highly evolved organization. The fact that the text of the Qur'an refers to this exemplary trio in the animal kingdom is in absolute keeping with the exceptionally interesting character that each of these animals has from a scientific point of view. "Thy Lord inspired the bees: Choose your dwelling in the hills, in the trees and in what (man) built. Eat of all fruit and follow the ways of your Lord in humility. From within their bodies comes a liquor of different colours where is a remedy for men." It is difficult to know what exactly is meant by the order to follow the ways of the Lord in humility, unless it is to be seen in general terms. All that may be said, with regard to the knowledge that has been gained of their behaviour, is that here-as in each of the three animal eases mentioned as examples in the Qur'an-there is a remarkable nervous organization supporting their behaviour. It is known that the pattern of a bee's dance is a means of communication to other bees; in this way, bees are able to convey to their own species the direction and distance of flowers from which nectar is to be gathered. The famous experiment performed by von Frisch has shown the meaning of this insect's movement which is intented to transmit information between worker bees. Spiders are mentioned in the Qur'an to stress the flimsiness of their dwelling which is the most fragile of all. They have a refuge that is as precarious, according to the Qur'an, as the dwelling of those who have chosen masters other than God. "Those who choose masters other than God are like the spider when it takes for itself a dwelling. Verily, the flimsiest dwelling is the dwelling of the spider. If they but knew." A spider's web is indeed constituted of silken threads secreted by the animal's glands and their calibre is infinitely fine. Its fragility cannot be imitated by man. Naturalists are intrigued by the extraordinary pattern of work recorded by the animal's nervous cells, which allows it to produce a geometrically perfect web. Birds are frequently mentioned in the Qur'an. They appear in episodes in the life of Abraham, Joseph, David, Solomon and Jesus. These references do not however have any bearing on the subject in hand. "There is no animal on the earth, no bird which flies on wings, that (does not belong to) communities like you. We have not neglected anything in the Book (of Decrees) . Then to their Lord they will be gathered." Two other verses highlight the birds' strict submission to God's Power. "Do they not look at the birds subjected in the atmosphere of the sky? None can hold them up (in His Power) except God." "Have they not looked at the birds above them spreading their wings out and folding them? None can hold them up (in his Power) except the Beneficent." The translation of one single word in each of these verses is a very delicate matter. The translation given here expresses the idea that God holds the birds up in His Power. The Arabic verb in question is amsaka, whose original meaning is 'to put one's hand on, seize, hold, hold someone back'. An illuminating comparison can be made between these verses, which stress the extremely close dependence of the birds' behavior on divine order, to modern data showing the degree of perfection attained by certain species of bird with regard to the programming of their movements. It is only the existence of a migratory programme in the genetic code of birds that can account for the extremely long and complicated journeys which very young birds, without any prior experience and without any guide, are able to accomplish. This is in addition to their ability to return to their departure point on a prescribed date. Professor Hamburger in his book, Power and Fragility (La Puissance et la Fragilité) [ Pub. Flammarion, 1972, Paris. ], gives as an example the well-known case of the 'mutton-bird' that lives in the Pacific, with its journey of over 16,500 miles in the shape of the figure 8 [ It makes this journey over a period of six months, and comes back to its departure point with a maximum delay of one week.]. It must be acknowledged that the highly complicated instructions for a journey of this kind simply have to be contained in the bird's nervous cells. They are most definitely programmed, but who is the programmer? "Verily, in your cattle there is a lesson for you! We give you a pure milk to drink, excellent for its drinkers; (it comes) from what, in their bellies, is between digested food and blood." "Verily, there is food for thought in your cattle. From what is in their bellies, among their excrement and blood, We make you drink pure milk, easy for drinkers to imbibe." If these texts were shown to a physiologist, he would reply that they were extremely obscure, the reason being that there hardly appears to be much agreement between them and modern notions, even on a very elementary level. These translations are the work of highly eminent Arabists. It is a well known fact however, that a translator, even an expert, is liable to make mistakes in the translation of scientific statements, unless he happens to be a specialist in the discipline in question. This interpretation is very close to the one given in the Muntakab, 1973, edited by the Supreme Council for Islamic Affairs, Cairo, which relies for its support on modern physiology. I have translated «inside their bodies' and not, as R. Blachère and Professor Hamidullah have done, 'inside their bellies'. This is because the word batn also means 'middle', «interior of something', as well as 'belly'. The word does not here have a meaning that is anatomically precise. 'Inside their bodies' seems to concur perfectly with the context. The notion of a 'primary origin' of the constituents of milk is expressed by the word min (in English 'from') and the idea of a conjunction by the word baini. The latter not only signifies «among' but also 'between' in the other translations quoted. It is however also used to express the idea that two things or two people are brought together. From a scientific point of view, physiological notions must be called upon to grasp the meaning of this verse. The substances that ensure the general nutrition of the body come from chemical transformations which occur along the length of the digestive tract. These substances come from the contents of the intestine. On arrival in the intestine at the appropriate stage of chemical transformation, they pass through its wall and towards the systemic circulation. This passage is effected in two ways: either directly, by what are called the 'lymphatic vessels', or indirectly, by the portal circulation. This conducts them first to the liver, where they undergo alterations, and from here they then emerge to join the systemic circulation. In this way everything passes through the bloodstream. The constituents of milk are secreted by the mammary glands. These are nourished, as it were, by the product of food digestion brought to them via the bloodstream. Blood therefore plays the role of collector and conductor of what has been extracted from food, and it brings nutrition to the mammary glands, the producers of milk, as it does to any other organ. Here the initial process which sets everything else in motion is the bringing together of the contents of the intestine and blood at the level of the intestinal wall itself. This very precise concept is the result of the discoveries made in the chemistry and physiology of the digestive system. It was totally unknown at the time of the Prophet Muhammad and has been understood only in recent times. 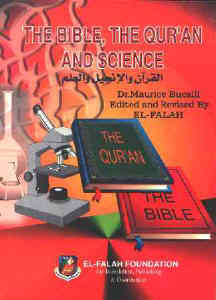 The discovery of the circulation of the blood, was made by Harvey roughly ten centuries after the Qur'anic Rev elation. I consider that the existence in the Qur'an of the verse referring to these concepts can have no human explanation on account of the period in which they were formulated.